On Saturday at the Valley Regional Congress in Panorama City, Neighborhood Council members from around the city will have the opportunity to "Get Connected" as they explore the free social media tools and embrace the new technology that will allow them to communicate effectively in the digital arena. The session will appeal to both novices and webmasters and an overview of tools such as Twitter, Facebook, MySpace, YouTube, WordPress, Blogger, StumbleUpon, Flickr, Picassa, Digg, Google, LinkedIn and Ning as well as ideas for including them as part of a neighborhood council strategy for outreach and communications and, most of all, for creating community. The idea that "if you build it, they will come!" may have made for a great movie but as a strategy for creating online traffic, it falls far short. "Get Connected" includes real techniques for driving website traffic, establishing blog footprints, maximizing email effectiveness, mastering the networking sites and communicating effectively in an environment that is rapidly changing the way we interact. The Valley Regional Congress is open to the public citywide and is designed to provide Neighborhood Council members with opportunities to forge alliances and coalitions while sharing information on topics ranging from land use to transportation to public safety to community building and connectivity. The League of American Bicyclists has a long history of fighting for the rights of cyclists. Formerly know as the League of Wheelmen, they have been around since 1880. In many ways not much has changed from the early days. The League was there in the early days to counter antagonism against cyclists from horsemen, wagon drivers, and pedestrians. Now we find ourselves up against motorists, bus operators, and law enforcement officers. The League was there in the early days leading 100K cyclists in a campaign for paved roads, an improvement that benefitted many and led to our national highway system. Along the way there have been ups and downs and discontent within the League but through it all, they have maintained a position as the national voice of cyclists. That's why it's especially hard to criticize but all the more important to point out when they fumble, especially when it sets local bike activists back in their efforts to make their communities "Bike Friendly." First there was the League of Bicyclist's award to the City of Los Angeles of an honorable mention as a "Bike Friendly" city last year. This tarnished the League's credibility and set the concept of "Bike Friendly" awards back a notch. Apparently the award was based on intentions and the fact that the City of Los Angeles had embarked on a Bike Plan update journey. That's the Bike Plan that was due last year and is still under wraps. Now there is the League of Bicyclist's award to the city of Santa Monica of a Bronze Status as a "Bike Friendly" city. The award is being given today. Santa Monica is a great city with many wonderful attributes and their bike valet program is one of the best. BUT surely a city with a police department that has a special "cycling suppression" detail that regularly squishes group rides and writes tickets that exceed common sense would get disqualified from the process. The League of American Bicyclists is a wonderful organization but it has completely destroyed the "Bike Friendly" program with it's completely disconnected and superficial awards to Los Angeles and Santa Monica. The greatest mistake in this process is that they didn't engage the cycling community in the process, they didn't require the award applicant to account for their relationship with the cycling community, they simply engaged in bureaucrat to bureaucrat award negotiation and I believe the cyclists who ride the streets of these communities deserve better. Attached is an article from the Santa Monica Press Telegram that covers the LAB Bronze award for Santa Monica. CITYWIDE — Boasting nearly 16 miles of bike lanes and a popular valet program catering to those who use pedal power, Santa Monica was recently recognized for being a bicycle friendly community by a national organization advocating on behalf of cyclists. The League of American Bicyclists, which represents the interests of the nation's 57 million cyclists, awarded City Hall with a bronze level distinction for its "remarkable commitments to bicycling," placing an emphasis on bike lanes, the valet program and future plans to build bicycle parking facilities Downtown. "We are trying to create a supportive environment for biking in Santa Monica and we feel we need to help people make different choices when planning a trip," said Beth Rolandson, a principal transportation planner for City Hall and an avid cyclist. "It's a challenge," Rolandson added. "It's really about education for everyone, both bicyclists and pedestrians, as well as drivers, so we can all co-exist safely." Santa Monica is the first city on the Westside to be honored with the award, and is joined by Long Beach, which represents the southern portion, among this year's honorees. The previous recipients from the county are Claremont and Santa Clarita. The news came as a shock to some riders who have complaints about City Hall's failure to keep pedestrians off the beach bike path and aggressive police officers harassing those participating in monthly, organized rides such as Critical Mass. "Santa Monica is a great place with the infrastructure in place and fun rides … but until we focus on equality and that becomes the foundation, we are never going to get that level playing field," said Stephen Box, co-founder of the Bike Writers Collective, which has created a "Cyclists' Bill of Rights" that has been adopted by the city of Los Angeles, but not Santa Monica. "If you focus on equality, then you can design streets that are good for everybody," Box added. "It's the basic principal that our streets are public spaces and [cyclists] should be equal partners in that space." Cities are recognized by the league for their role in actively supporting cycling for fun, fitness and transportation and are judged by their record in promoting bicycling in five key areas: education, engineering, enforcement, encouragement, and evaluation. Nationally, 108 of the 274 communities that have applied have been honored, representing some 37 states, according to the league. The bronze designation is one with real meaning since it is difficult to earn, and all applications are carefully evaluated by a team of local cyclists, national experts, and League of American Bicyclists staff, representatives form the league said. This past Monday, Enci and I were riding south on Vermont, a couple of hundred yards north of Prospect. We were riding southbound on Vermont in lane #2 alongside parked cars at approximately 3:25 pm in light traffic. I was in the lead, Enci was in second position and the bus was in third. I heard Enci scream, I looked back and saw a bus behind me but not Enci. I pulled over and the bus passed me, pulling to the curb just yards further on. Then I saw my wife riding down Vermont. Bus Operator #25119 had just "asserted" himself into the #2 lane at the expense of my wife's position and in doing so, forced my wife to choose between the side of the bus, the parked cars or simply braking to avoid getting hit by the bus as it came from behind alongside her and then simply merged right toward her. This incident drew a Metro Supervisor, two Sheriff's Deputies, an LASD Supervisor, LAPD officers from both Hollywood (4) and NorthEast (2) and an LAPD Supervisor. Quite a significant show of force! 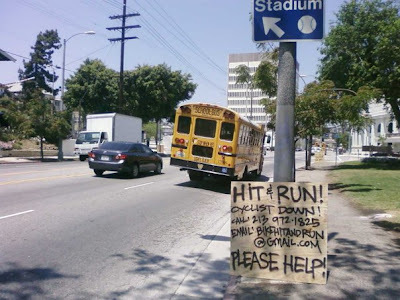 The Bus Operator was long gone when the first LAPD officers responded to my call. As we stood on Hollywood Blvd. talking to the officers, Operator #25119 came back on his return route, graciously slowing down and waving, apparently enjoying the spectacle. Imagine his shock when Officer Lee WALKED off in pursuit and pulled the bus over. Through it all, we experienced a cloud of jurisdictional confusion over who takes the report and law enforcement confusion over whether or not it's a crime to run a cyclist off the road. I went to the Metro Board on Thursday to address 1) this incident 2) the issue of training and oversight of bus operators on safe interaction with cyclists on the road 3) the jurisdictional confusion 4) feedback opportunities for the metro on weekends and holidays. It was a crazy session, public comment was scheduled for the end of the meeting and then moved to the beginning. It was a full house with overflow in the cafeteria. They moved public comment from the end of the meeting to the beginning and all of a sudden I heard them call my name. I was prepared for a two minute speech but they cut us down to 60 seconds and so I gave it my best. I went over my time and kept going, committed to hitting the 4 points and I thought County Supervisor Knabe was trying to cut me off, then I realized he was calling over Jack Gabig, the Division Manager, who motioned for me to follow him out a side door. For a moment I flashed on that scene from Casino and imagined a bunch of Metro Operators waiting "backstage" but with RoadBlock and Courage flanking me, I figured I was in a good position. Mr. Gabig spent half an hour taking my complaint and I'd like to think we're on our way to starting a relationship between cyclists and bus operators, one that puts our safety before their schedule or convenience. Attached is an email I sent as a recap of that meeting. Thanks for taking the time to talk with me at the Metro Board Meeting and for discussing the details of my complaint. I wanted to recap the specific elements so that you can address them or direct me to the appropriate person. 1) Metro vs. Cyclist incident from this past Monday. My wife was riding her bike south on Vermont, in contol of the #2 lane, when she was run off the road by Operator #25119. From our first encounter with a Metro supervisor to those we speak with along the journey, it is made clear that this is a personnel issue and that we have no right of access to the Metro file or process. I contend that Metro passengers and those on the streets and sidewalks also have rights and that the Metro can surely balance the personnel limitations with appropriate resolution and communication of this complaint. Further to the potential claim that this is a personnel issue, I would contend that this is, first and foremost, a criminal complaint. 2) Metro Training and Oversight: This incident, along with similar incidents, indicates a need to address the training and oversight of the Metro's Operators. From honking unnecessarily to passing unsafely, CVC violations must not be tolerated, especially when they endanger the lives of cyclists. The Metro's manual calls for 3 to 4 and a half feet of passing room for cyclists but some operators still "assert" themselves and squeeze cyclists. The Metro's manual refers to "cyclists and other road hazards" indicating a culture of primacy that results in unsafe and illegal behavior. 3) Jurisdictional confusion must be resolved: Once again, we experienced jurisdictional confusion as my call to LAPD resulted in 1 Metro Supervisor, 2 Sheriffs, 1 LASD Supervisor, 2 NE LAPD Officers, 1 NE LAPD Supervisor, 4 Hollywood LAPD Officers. One shouldn't have to watch law enforcement officers debate jurisdiction in order to report a crime. One shouldn't have to know the system in order to get the full support of the system. If there is a memorandum of understanding between the LASD and the LAPD with regards to jurisdiction on the streets, the rail lines, the busway and the bike paths, please consider this a formal request for that MOU. 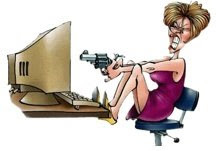 4) Metro Customer Service is cumbersome and ill-equipped to handle simple complaints, as evidenced by the deluge of tweets, messages, emails, texts and verbal stories I received over the last 3 days that conclude with "I tried to contact the Metro but I gave up!" One would think that from a simple loss prevention position, the Metro would want a customer service system that yields good accurate data on safety and performance. And yet...the current system doesn't allow someone to call in during the evening, on weekends and holidays. There's not even an answering machine in place! Most important is the need for significant improvement in acknowledging complaints and reinforcing the process by communicating resolution, even if in general terms. But there must be some confirmation that the process works. I thank you for your help in addressing this specific situation and the larger opportunity of the relationship between the Metro and cyclists. As I mentioned today, cyclists and bus operators move at the same speed across town and share the curb lane so it's imperative that we develop a relationship based on equality and respect. 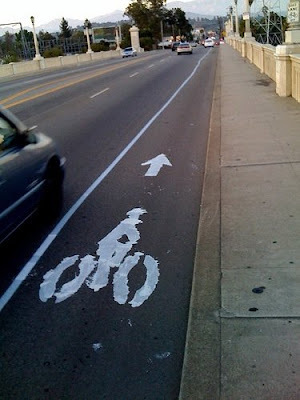 LADOT to Cyclists "There's no more room for cyclists!" 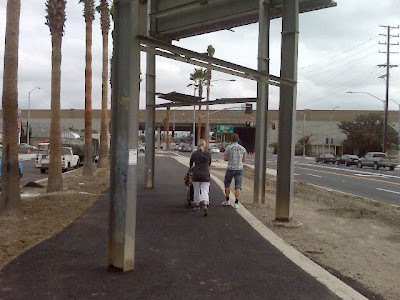 The LADOT's Bikeways Division, aka "the Department of No!" has a presentation that should be entitled "Why you can't have what you want." For years now, Bikeways staff has been offering up excuses for their lack of innovation and progress, explaining "LA is simply built out. There's no more room for cyclists!" This month's Bicycling magazine quotes the Bikeways Division's spokesperson as saying "What I need is roadway. 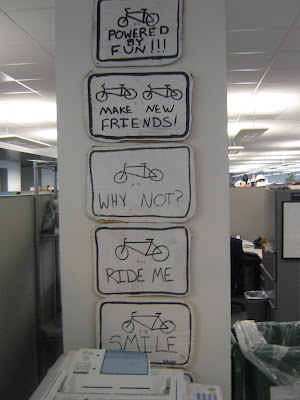 Right now, all I can do is try to find places to squeeze bikes in." The LADOT has repeated this for so long it starts to sound like the truth. Over and over, Bikeways Reps claim there's no more room. This goes unchallenged by real debate or discourse, leaving a wake of bobbleheads behind, all chanting "There's no more room!" The streets of Los Angeles are actually pretty wide. Especially if you get the parked vehicles off the main streets. Sunset Blvd. and Hollywood Blvd. are notorious for 18 Wheelers and Commercial vehicles, all parked for long stretches, not for deliveries, not for errands, not to simply stage them between runs but for days on end. Best part, they're parked illegally! Let's ticket them! Let's tow them! Let's open the streets up for the movement of goods and people! Let's get LA moving! 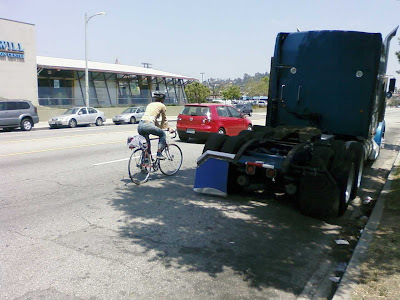 Even when there is already a bikeways facility in place, the LADOT is hesitant to enforce. 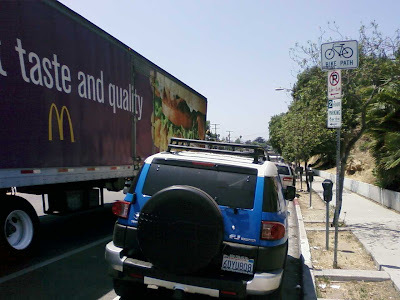 In fact, the LADOT Parking Enforcement Division still doesn't even enforce CVC 21211(b) which prohibits a vehicle from blocking a bike path or a bike lane. 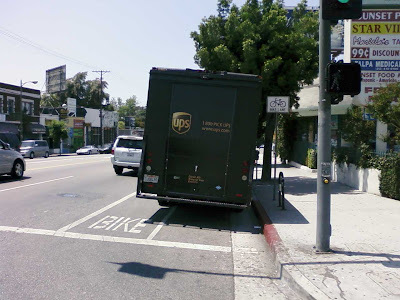 Two years ago, Transportation Committee Chair Wendy Greuel initiated a motion that would modify the existing law and penalty schedule so that the City could enforce the ban on blocking bike lanes in the City of Los Angeles. I was there as the Department of Transportation's Michael Uyeno stepped up and said that things were fine the way they were. Uyeno oversees the Bikeways Division. This moment of "fuhgettaboudit!" was quite the reveal. His advice was roundly ignored and the motion made its way through the Committee and the City Council and on May 14, 2007 San Antonio himself signed the City of LA ordinance #178794 establishing penalty provisions applicable to CVC 21211(b). In other words, if you park a car so that it blocks a bike lane, it's gonna cost $70 and $150 the second time! Here's an idea. Let's all chip in and get some bikes for the folks over in the LADOT's Bikeways division. Then let's get them to ride with us from downtown, through the 2nd street tunnel (it's fun! Howl, we all do!) up Glendale Blvd., then west on Sunset Blvd. and then Hollywood Blvd. Then let's attack the fallacy of "there's no room!" and let's seriously go after some solutions. Why aren't there Sharrows on Glendale Blvd? It has parking on both sides, there's loads of room and it's posted for 35 mph, complete with speed zone certification and eligible for radar/laser speed limit enforcement. It even has a body count that would seem to indicate the need for some traffic calming support. Keep in mind it's also alongside a park, a church and loads of residential. Why are the bike lanes on Sunset Blvd. blocked by vehicles and where is the LADOT's Parking Enforcement? Why aren't they fully trained on the enforcement authority of the prohibition against blocking a bike lane. It's been 2 years! Write the tickets, tow the vehicles, support those who need your help! Why is Hollywood Blvd. used as storage for 18 Wheelers, in clear defiance of "Anti-Gridlock" signs and "1 hour parking" signs and red curbs and all sorts of prohibitions? 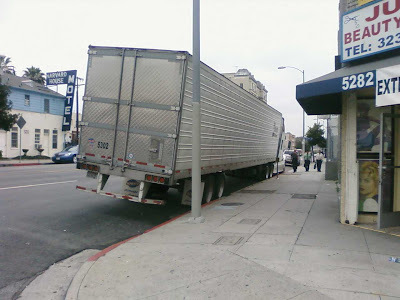 Why is all of this ignored by LADOT Parking Enforcement officers who can not possibly claim to not notice these monstrous lane blocking trucks? After all, they also have to swerve to miss them! Seriously, there is plenty of room in this city for us to all get along, for us to all use the streets and to do it safely and equitably. Let's get the LADOT up to speed on this concept and then let's get them up to speed on the enforcement of LAMC and CVC and then let's get them up to speed on the innovations that will make our streets safer and more effective for everybody. It's the largest City in the most populated State in the most powerful Country in the world. Los Angeles is actually bigger than big. Los Angeles is BIG! Which means that when LA is in financial trouble, like now, it's in BIG financial trouble. As LA's leadership lumbers through the budget morass, the public keeps hearing that the crisis is especially difficult for LA because the City is so big, so cumbersome, so complicated. Solutions don't come easily and change takes time, after all, LA is BIG! All of which sounds plausible. As we're often told in budget meetings, it takes time to turn a battleship and, well, they're also very big. After all, smaller cities can throw a bake sale or fire the dog catcher and balance the budget but LA, well, it's so BIG! Fast Company magazine featured the travails of some companies that are also recognized as being big. Some of them have pretty big budgets, perhaps even bigger than that of Los Angeles. They've weathered financial storms just like LA and they've prevailed, even grown from the experience. After all, the City of LA is actually a $7 billion service industry corporation, bound by the simple mandate to increase revenue and/or reduce costs, all while efficiently and effectively servicing the four million customers/stakeholders who own the company. Fast Company's "Through the Fire" article looks at the experiences of Cisco, Corning, IBM, Intel and Schwab, and offers up five strategies for exiting the storm even stronger. Intel's 1st quarter revenue was $7.1 billion, down 26% over last year. They responded by doubling down, investing more in their core but hedging the bet by backing it with a commitment of collaboration with their customers, turning an 18 month game plan into a long-term plan. Key take-away, a collaboration turned the customers into partners and the load lightened. Los Angeles, by way of contrast, threw kidney punches and alienated stakeholders rather that drawing them in as partners. The Mayor's budget process is a sham, guaranteed to alienate participants so that their term of duty rarely exceeds one year. The budget survey's superficial review of the process is an insult to a city full of talented innovators, professionally committed to making this a Great City but denied that same participation at the civic level. Corning went through the budget crisis drill just a decade ago when its revenue went from $7 billion to $3 billion in just 18 months. They said never again. They instituted an early-detection system and positioned four "operational rings of defense" that started with simple spending cuts and hiring limits, moved to reduced work weeks, limited use of contractors and temps and finally resulted in layoffs resulting in staff cuts of 13%. As dramatic as the current crisis is, they had a plan and they avoided the 4th ring, which was to sacrifice their core: Research & Development. LA, by way of contrast, floundered as the moment of decision approached and was still debating "share the pain" staffing reduction plans from departments that had no "rings of defense" strategy in place, just departmental commitments to survive, even at the expense of the host. Schwab found itself in a tough place, asking people with less money and less confidence to trust them as they struggled to be optimistic and honest in a bleak financial environment. Schwab's solution was to engage in conversations and to provide information at lightning speed. People are hungry for relationships they can trust and Schwab satisfied that need by engaging its customers and allowing a community to evolve. LA, by way of contrast, allowed the budget battlefield to, again, break down into dueling departments and constituencies, rather than simply engaging the customers in the process and allowing a community to evolve. Confidence was never the commodity associated with City Hall and the City’s leadership spent more time producing panic rather than hope. It was the Neighborhood Council leaders who called on the City to "Partner in Greatness," not the Mayor and the City Council. IBM employed a "follow the money" strategy and focused on its core strengths, going after the significant IT money being spent as part of the stimulus package. 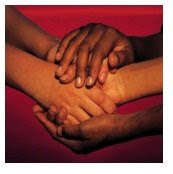 Of course, this required focusing the energy of the entire company on a specific strategic plan, which it had in place. IBM's Smarter Planet initiative was launched this past November and positioned the company to go after new business such as energy and utilities. LA, by way of contrast, has no long term strategic plan, lacks a clear idea of its strengths and still uses a fragmented IT strategy that has departments unable to communicate with themselves, all of which leaves us far behind while smaller cities innovate and partner and put technology to work. IBM partnered with Dallas and is implementing smart utility metering that offers feedback on cycles as tight as 15 minutes which positions the city to realize a 10% reduction in utility usage and the resulting environmental benefits, all as the result of IBM's "getting smart" and "following the money" strategies. Cisco simply survived the meltdown by embracing technology, creating community and personalizing the experience. Cisco's Mike Metz explains "There aren't enough salespeople in the world for what we need to do." Cisco's "market transition" has resulted in more efficient delivery of services resulting in hundreds of millions of dollars in revenues. LA, by way of contrast, still employs a Council District Deputy system that has "handlers" hustling down the delivery of services and the facilitation of solutions, typically duplicating the 311 service but actually just adding another layer of bureaucracy to an already swollen and compartmentalized system. For too long the people of Los Angeles have heard "LA is so BIG!" as an excuse for mediocrity and, in the current budget crisis, as an excuse for catastrophe. Larger entities with equally daunting challenges have survived the meltdown and come out stronger and in better position. Through it all, it's important to keep in mind that the differences between the five companies referenced in this exercise in innovation are many, including the fact that they all faced significant reductions in revenue while the City of LA has been enjoying a dramatic increase in revenue over the past five years. LA's problem is that increases in costs and obligations have outpaced increases in revenues. LA's fork in the road is to look for inspiration in the success stories of companies that have employed the full spectrum of innovations or take the path of GM and to embark on the road of desperation. Either way, it's our choice. It's time for Los Angeles to demand a vision, a strategic initiative, and a long term plan for exploiting opportunities and for weathering the inevitable storms. It's time for the leadership of Los Angeles to personalize the experience of living in LA, to make communication the foundation for community, not simply a Brown Act required exercise in process, and it's time to partner with the innovators and the problem solvers and the community leaders who are committed to making Los Angeles a Great City. LA's budget crisis seemed so bad the Department of Transportation actually carried the Bikeways division to the edge of the volcano, apparently fully prepared to toss it over the edge, willing to sacrifice it all in an effort to save the city from financial collapse. At the last minute, it was revealed that the threat was hollow, that the Bikeways Division is Prop C funded meaning that if the staff were canned, the city would then simply return the "Congestion Relief" funding, resulting in no financial benefit to the City's General Fund. Nevertheless, it was all part of an exciting week as department after department, constituent group after constituent group, union after union and, eventually, department head after department head, all paraded before the city council and begged a second bowl of porridge. Why, one would think we're in the middle of a financial crisis. Truth be told, we're actually doing all right. Since San Antonio has stepped up as LA's 11% solution, the city's annual revenue has grown from $5.4 Billion in to $7.1 Billion. LA's crisis is not one of shrinking revenue but of escalating costs that are rapidly exceeding the 31% increase in revenue. All of which brought the city to a moment of truth when somebody pointed out that the days of lean are on their way. Call for moderation drew challenges of "You first!" and the city went to the wire, wrestling all the way. When the dust had settled, money had magically appeared, the budget was balanced and everybody agreed to "Share the Sacrifice" meaning 10% cuts throughout the city and furloughs, layoffs and other austerity measures positioned for implementation. As for the LADOT's Bikeways Division, they survived intact. Phew! Of course, LADOT's Bikeways Department hasn't been idle. Bikeways was on the job last year when the Department of DIY pitched in to help with the public works backlog, painting a bike lane on the Fletcher Bridge. The paint was barely dry when the Bikeways staff moved with uncharacteristic speed, painting out the bike lane and removing the supporting signage. Bikeways staff reported at the August Bicycle Advisory Committee and in the press that the DIY bike lane was dangerous, resulted in "lost goodwill" and put cyclists in danger. Phew! 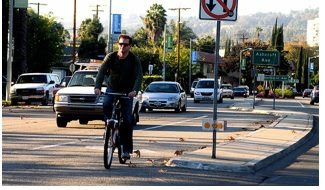 Bikeways was also on the job last year when Westside cyclists needed a little extra excitement on their Culver Blvd. Bike Path. This Bike Path is on former Red Car land that belongs to the Metro but there is a cooperative agreement in place that allows the city to operate a bike path. Definitely safer than the Fletcher Bridge! But most of all, Bikeways was on the job last year, developing the Sunset Boulevard Bike Path, a Class I mixed use path between Alvarado and Coronado, right in the heart of Silver Lake. What a bold move! The Sunset Boulevard Bike Path! Definitely safer than the Fletcher Bridge! It's moves such as this that leave one wondering "Is the volcano still warm?" Rhode Bloch sat in the front row of City Council chambers, having arrived early in order to claim his 60 seconds of Public Comment time. This was Monday when he challenged the City Council on its commitment to a greener LA, a healthier LA and a safer LA, concluding by urging them to join him in working to make the streets of Los Angeles safer for everybody. That night, Rhode Bloch lay on Glendale Boulevard, dropped by a hit and run motorist traveling 45 -50 mph who came from behind and hit him at speed, braking only after Bloch was already on the hood of the car. The motorist didn't stop to see if the cyclist was dead or alive, the motorist didn't call for assistance, the motorist simply left him in the street where he landed. The incident took place alongside Echo Park Lake, just a 100 yards south of the location where Jesus Castillo lost his life a month ago, also riding home alone at night on Glendale Boulevard. Rhode Bloch is a blessed cyclist, he survived the incident and he is recovering quickly. On Tuesday morning, just hours after the hit and run incident on Glendale Boulevard, the City Council convened with an agenda that included speed limit increase proposals for Zelzah and Balboa Avenues. This huge disconnect between "talk" and "walk" could not be more exaggerated if it were staged. The debate over the "science" of the establishment of speed limits is old. The City Council claims their hands are tied and the critics claim it's not science it's simply an opinion poll for motorists who use their gas pedals to cast their vote. 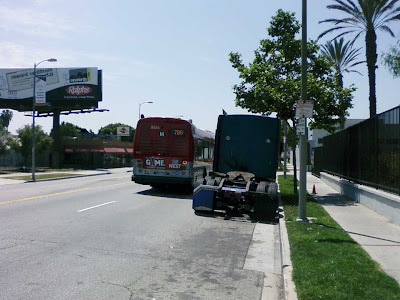 Over the past year, it seemed that the leadership of Los Angeles and the community members who are clamoring for safer streets that are walkable, ridable and livable had begun to agree that the State's "Speed Trap" law needed revising. Along came Assistant Majority Leader Paul Krekorian with AB766, the Safe Streets Bill, and it was clear that the leadership of Los Angeles was behind a movement to revise the State's antiquated "Speed Trap" law. At least that's how it appeared. Transportation Committee Chair Wendy Greuel and Councilman Richard Alarcon stood alongside Assemblyman Paul Krekorian and announced their support for the Safe Streets Bill which went to Sacramento last week, purportedly with the support of the Mayor and the City Council. All of which is in stark contrast to the reality of the State Assembly Transportation Committee hearing where bike activists showed up to testify in favor of the bill, where neighborhood council representatives showed up in support of the bill and yet nobody from the City of Los Angeles stood in support of the Safe Streets Bill. One might argue that Sacramento is a long way from Los Angeles but keep in mind, the LA Department of Transportation had a representative sitting in the room to testify in support of another bill. 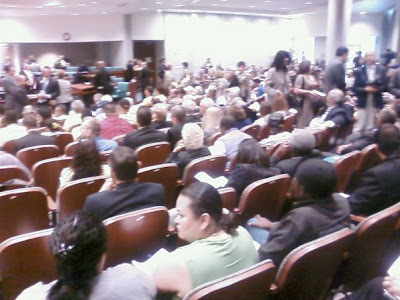 The City of Los Angeles had a lobbyist sitting in the room to stand in support of another bill. Both individuals clearly identified themselves as speaking on behalf of the City of Los Angeles and yet neither of them spoke in support of the Safe Streets Bill. This failure to represent is in stark contrast to the stated support for safer streets that we receive at every turn in the debate. As for this past Tuesday, I took the time to trek downtown and I stood prepared to protest the speed limit increases but it was for naught. Councilman Smith pulled the Zelzah proposal, asking for 30 days, so it is tentatively scheduled to return on June 19. As for the Balboa Avenue speed limit proposal, it somehow made it to the City Council agenda without stopping at the Transportation Committee for the obligatory rubber stamping that is part of the assembly line like process for increasing the speed limits throughout the City of Los Angeles. It was also pulled from the agenda. I took the opportunity to speak of Rhode Bloch's testimony the day before and his near tragic experience on Glendale Boulevard. I concluded by calling for a moratorium on speed limit increases for the streets of LA and asked that the City instead get behind AB766, the Safe Streets Bill. As for Glendale Boulevard, the debate over speed traps and the state law is irrelevant, at least for now. Glendale is certified and posted for 35 mph and the speed zone survey is valid through July of 2010. Nobody's hands are tied! Fresh on the heels of a move to liberate the department of any responsibility for LA's Safe Routes to School program, the LADOT stands before the City Council with proposals to increase the speed limits for Zelzah and Balboa Avenues. These controversial proposals have been struggling through the process, picking up significant community opposition and stalling, first in the Transportation Commission and then again in the Transportation Committee, all while other speed limit increase proposals have sailed through the City Council. The proposed speed limit increases are the result of the state- mandated speed zone surveys, all required in order to use radar/laser for speed limit enforcement. State law provides that the speed limits be set so that 85% of the motorists currently driving that street be considered legal. 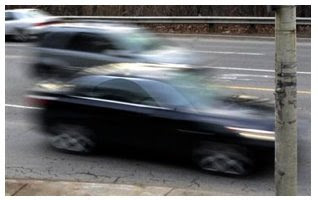 This often results in speed limits being raised as motorists "vote with the gas pedal!" It was just a week ago that Assistant Majority Leader Paul Krekorian's AB766 - Safe Streets Bill had its day in the Assembly Transportation Committee. This bill proposed that communities should have the opportunity to convene a public hearing and, if determined that an increase in speed would be detrimental to pedestrian and cyclist safety, to simply retain the speed limited as posted. The Safe Streets Bill arrived in Committee with significant support from Los Angeles. The Mayor and the City Council both endorsed the Safe Streets Bill. The Los Angeles Neighborhood Council unanimously endorsed the Safe Streets Bill. Transportation Committee Chair Wendy Greuel and Councilman Richard Alarcon both stood with Assemblyman Paul Krekorian and called for equality as the underlying principle to rely on when establishing speed limits. Greuel complained that under current law, "We only get two choices and they're both bad. Raise the speed limits or stop using radar!" Alarcon spoke of establishing speed limits based on equality and called for a process that weighed the needs of everybody, including pedestrians, cyclists and mass transit passengers. The Safe Streets Bill was opposed by the AAA, the Teamsters and the CHP, all of whom defended the status quo as being completely reasonable. Transportation Committee Chair Mike Eng agreed saying the speed trap law has worked for the last 30-50 years and there was "no reason to mess with the science." The Safe Streets Bill failed to pick up approval and it remains in the Transportation Committee of the California State Assembly. The bill now goes to a public hearing which pleases supporters who want to get the topic out into the public arena for a robust discussion. Both Krekorian and Alarcon joined the Valley Alliance of Neighborhood Councils this past Thursday and engaged in a robust discussion of the bill. Krekorian indicating that he was calling for the State Assembly Transportation Committee hearing on the Safe Streets Bill be held here in his district. CityWatchLA - Dude, Where’s the Bike Plan? It's been almost six months since the LADOT's Bikeways staff went before the Transportation Committee and announced that LA's Bicycle Plan would be presented to the community in January of 2009. January has come and gone and the four promised community meetings haven't taken place, the draft document hasn't been delivered and the community hasn't been given the opportunity to participate in the process. LA's Bicycle Plan is part of the Transportation Element of the General Plan of the City of Los Angeles and it is intended to guide the city in the development of a citywide bicycle transportation system as well as support efforts to fund bicycle projects and programs. The Bicycle Plan is funded with Transportation Development Act funds to the tune of $450,000 and the work is being performed by Alta Planning, a consulting firm based in Portland and Berkeley. The City's Department of Planning is the lead on the project although it's the LADOT using Prop C funds to pay for their staff to work on the project. Cyclists have gone on record with great hopes that the "2008 Bicycle Plan" would be a powerful document full of vision and commitment. Instead they have been rewarded with silence and exclusion. Most recently, the Bikeways Division of the LADOT went before the Arts, Parks, Health and Aging Committee to explain their "closed" meetings conducted by consultants from Colorado, all as part of the Bicycle Plan public engagement initiative. Committee Chair Tom LaBonge expressed concern with "closed" meetings being held as part of the Bicycle Plan process, especially in City Hall. He deferred to the City Attorney who also expressed concerns with the process and suggested that the LADOT report back to the committee in 30 days. LaBonge concurred and gave the direction. In response to criticism of the process, the Bikeways rep leaned into the microphone and said "It should be noted that the Department of Planning is the lead on this process." The four public workshops held early last year were met with significant criticism and charges of weak and ineffective outreach. The meetings were held with such little notice that even the City's own Bicycle Advisory Committee had no warning and couldn't agendize the workshops or act to support or contribute. The consultant from Portland came under fire during the first session when she positioned the Bicycle Plan as a funding document, perhaps music to the ears of bureaucrats but hardly the battle cry of a room full of cyclists who want to know how to make LA a great place to ride. She continued by dividing cyclists into four groups, failing to acknowledge what's often referred to as the "invisible" cyclist, the Workforce Cyclist. They don't ride for fun or to change to world or to get some exercise, they simply ride as an economic necessity and they often ride late at night, unsupported and often unclear on rules of the road or right of way. Things got worse, not better, at the second workshop and that was the last LA heard from Portland. Since then, Alta Planning has been busy with the Pasadena Bike Plan, the LA County Bike Plan and who knows what else. 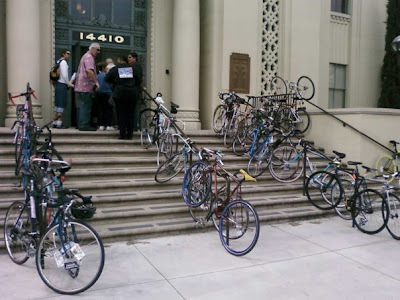 Meanwhile the cyclists in LA wait for a Bike Plan that was supposed to be delivered to the City Council month ago. But before it gets to the City Council, there are supposed to be four public workshops and a trip to the Transportation Committee which means that the Bike Plan might end up being a year late! Perhaps the consultant from Portland with all of the funding experience was correct when she positioned the Bicycle Plan as a funding tool although we never imagined that it was the development of the plan that would be the funding opportunity. "I'm going to Sacramento and I need your help!" 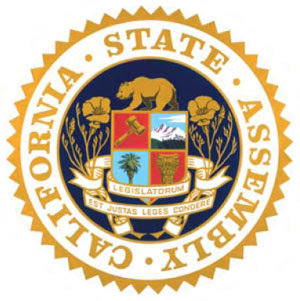 On Monday, May 11th, Enci and I will be in Sacramento to testify in support of Assistant Majority Leader Paul Krekorian's AB766 "Safe Streets" bill which will give local communities more control over the establishment of speed limits in their neighborhoods. We'd like your help. This past year I have attended LA's Transportation Commission meetings, Transportation Committee meetings and City Council meetings, all in an attempt to stop the increase in speed limits throughout our city. Time after time, our city's leadership has explained that their hands are tied, that they are simply complying with State law and that it's the same standard for those in the High Sierras to those in Los Angeles. I happen to disagree with that scenario and I'm going to fight to make sure that local communities have control over the speed limits in our neighborhoods. At issue is our desire to use radar and laser for speed limit enforcement. This requires the City of LA to perform speed zone surveys and to certify the speed limit using a formula that establishes the speed limit at the 85% mark of the prevailing speed of traffic. In other words, motorists vote on the speed limit with the gas pedal and in many cases, the speed limit gets increased, all as we simply attempt to control speeding. With Krekorian's bill, neighborhood councils will be able to address the dangerous trend of rising speed limits, which have unfortunately led to accidents with pedestrians and bicyclists and, in a few tragic cases, fatalities. These engineering studies – under which the speed limits have been creeping up - fail to take into account the human element of traffic and end up endangering our neighbors. Quite simply, the Safe Streets Bill aims to provide local governments with an additional tool to keep the speeds traveled on local roads at a safe level for drivers, pedestrians, and communities as a whole. The legislation balances the ability of drivers to safely drive on city streets at a reasonable speed with the needs of bicyclists, residents and pedestrians to be able to access those same streets without an undue risk of a collision, thus enhancing both community safety and traffic flow. There are several ways you can join us in this fight to make our streets safe for everybody and to return control over our streets to the local community. 1) Join us in our journey to Sacramento. We'd love to have your company and to have you join us in speaking up for local authority and community control. 2) Give us a letter of support that we can carry with us and introduce into the record. Tell the State Assembly who you are, where you live, your experiences with speeding traffic on the streets of your community. Join us in endorsing Krekorian's AB766 "Safe Safe Streets" bill. Email your support to SafeStreets@BikeWritersCollective.com. 3) Pass this letter on, or forward this email to your friends and family and neighbors and ask them to support our efforts to make our neighborhoods safe for everybody. 4) Call or email your City Councilperson and ask them to support this endeavor, after all they're the ones who have long been complaining about not having their hands tied when it comes to setting speed limits. Now's the time to speak up! 5) Follow our journey on Twitter, on Facebook, on our blogs at illuminateLA and at SoapBoxLA. AB 766, as introduced, Krekorian. Vehicles: speed limits. 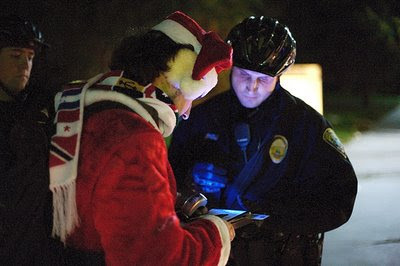 Existing law permits a local authority to decrease or increase a prima facie speed limit on any street, other than a state highway, based on an engineering and traffic survey, and for enforcement purposes requires that survey to be redone after a certain number of years. This bill would allow a local authority retain a prima facie speed limit on any street, other than a state highway, if the local authority makes a finding, after a public hearing, that a higher speed limit is not the most appropriate for the orderly movement of traffic upon the street and does not promote a safe environment for the neighborhood or pedestrians. 22358.2. (a) Notwithstanding Section, 40802, a local authority may retain a prima facie speed limit that is provided by this code or by local ordinance under subparagraph (A) of paragraph (2) of subdivision (a) of Section 22352, or established under Section 22354, 22357, 22358, or 22358.3 on any street other than a state highway, if the local authority makes a finding, after a public hearing, that a higher speed limit is not the most appropriate for the orderly movement of traffic upon the street and does not promote a safe environment for the neighborhood or pedestrians. (b) If a local authority makes a finding pursuant to subdivision (a), the prima facie speed limit does not have to be rejustified by an engineering and traffic survey as provided in Section 40802. "Storm the Bastille" cyclists rode to City Hall to call on the City Council for support and after an hour and a half of public testimony, the City Council responded with a Motion directing the LAPD to investigate and address police officer training. The issue that prompted the cyclists to ride was the recent Hummer vs. Cyclists incident when a Hummer driver hit a cyclist, left the scene and then ran over the bikes of the cyclists who were trying to get his license information. The week prior, Jesus Castillo was killed by a hit and run driver who was caught within hours, found to be driving on a suspended license, yet was out on bail before the Ghost Bike for Jesus was even placed on the street. Many of the cyclists who spoke referred to these incidents as part of a larger gestalt of contempt for cyclists. They called on the City Council to address behavior that ranges from motorists who endanger the lives of cyclists to police officers who harass cyclists. The most significant charge was that the LAPD is actually endangering the lives of cyclists by using their cars recklessly to herd cyclists on group rides, aggressive acts that are ineffective and dangerous. Councilman Smith interrupted today's meeting after the first speaker to advise the Council that this was an inappropriate venue for a complaint of LAPD behavior and to advise the cyclists to take it to the Police Commission. The cyclists responded "We've already been there this past Tuesday!" The City Attorney allowed that the City Council was the right place for the testimony. The Hummer victims testified and called on the Council to explain how the Motorist could be allowed to drive away after hitting a cyclist, leaving the scene and then running over three more bikes. Roadblock called on the City Council to address the LAPD;s aggressive behavior, and cyclist after cyclist gave their personal experiences and stories, all concluding by asking the City Council to step up and support cyclists as transportation solutions, not problems. Alex Thompson cut to the chase and addressed the LAPD's treatment of cyclists and the City Council's failure to support cyclists by following through on the motions and resolutions that go nowhere. Enci spoke of her origins in Eastern Europe and the fact that when she made it to America, she experienced freedom and equality like never before, until she climbed on a bike and then became a 2nd class citizen. I called on the City Council to examine their record. The Reyes motion of 2006 addressing the rights of cyclists when hit by a car was approved unanimously and then simply faded into oblivion. The motion setting aside $400K for a Bike Map was approved unanimously and then the money disappeared but yet no map. The motion setting aside $450K for the bicycle Master Plan was approved unanimously and it was due in 2008. No Plan, no word, no respect. We took the Cyclists' Bill of Rights to the City Council and they endorsed it, advising the departments of the City of Los Angeles to report on how to incorporate it "into the City of Los Angeles Bicycle Master Plan and other relevant documents and practices." No reports, no action, nothing has happened. "What's it gonna take for the City Council of the largest City in the most Populated State in the most powerful Country in the world to make safety on the streets a priority?" 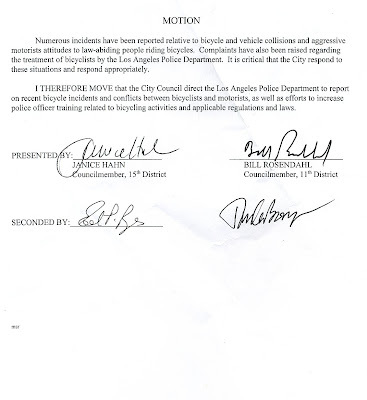 Councilman Bill Rosendahl and Councilwoman Janice Hahn responded with a motion directing the LAPD to report back to the City Council and to address the complaints and the conflicts and the issue of police officer training on bicycling activities and laws. Rosendahl, Hahn, Reyes, Greuel all responded to the public testimony of the cyclists and committed to addressing the issues and to supporting the Cyclists' Bill of Rights. Cardenas wrapped by suggesting that the cyclists go to the police Commission, earning a thundering "Been there!" from the room. It should have ended there but Councilman Tom LaBonge stepped up and puffed out his chest and said "Take me to your leader!" He went outside to the front steps of the Van Nuys City Hall and gave a meandering pontification that veered from "Yes, we can't!" explanations of how hard progress really is to an explanation of Equestrian licenses to a lecture on responsibility and the downside of group rides. He tossed in his interpretation of the 3 E's, forgetting that there are really 6 E's. He left out Evaluation, Encouragement and EQUALITY. All this from a guy who still doesn't have bike racks at this field offices. At the end of the day, it remains to be seen whether this "Storm the Bastille" ride will have any impact. For the cyclists it was a great day, a great ride and a great opportunity to forge a stronger community of cyclists. After a celebration lunch at Joe Peep's Pizza, some went off to play bike polo, some went back to work, and others headed of to DTLA's May Day activities.